Hurricane season begins June 1 (May 15 for the Eastern Pacific) and ends November 30. During this time, and throughout the year, the NHC issues tropical weather forecasts via National Weather Service radio broadcasts, on their website, iAlert.com, and other outlets. When hurricane conditions develop within 36 hours, the NHC issues appropriate advisories and warnings to ensure timely evacuation and/or emergency relief of areas predicted to be in the path of the oncoming storm. These functions can affect inhabitants of numerous countries because the World Meteorological Organization has designated the NHC a primary weather prediction center in the Northern Hemisphere. Using satellites, buoys, and reconnaissance aircraft, the NHC considers its sensing capabilities crucial for issuing timely and accurate forecasts. These observations are checked, rechecked and plugged into computer models that generate patterns of hurricane behavior and relevant atmospheric conditions. Predictions are then vetted among national centers and local forecast offices to provide the most consistent information during potentially devastating weather events. To give the clearest picture of an oncoming storm, the NHC uses the Saffir/Simpson Hurricane Scale (SSHS) that combines wind, pressure, and surge values, based on data collated from previous storms. For example, a Category 1 storm (least severe) would have winds ranging in velocity from 74-95 mph, a barometric pressure of 28.1 inches, and a storm surge of 4 to 5 feet, with minimal damage anticipated; a Category 5 storm (most severe) would have winds of over 155 mph, pressure less than 27.17 inches, and a storm surge over 18 feet, with “catastrophic” damage potential. Paradoxically, the anticipated rainfall from a hurricane and potential flooding is not used to categorize its strength. 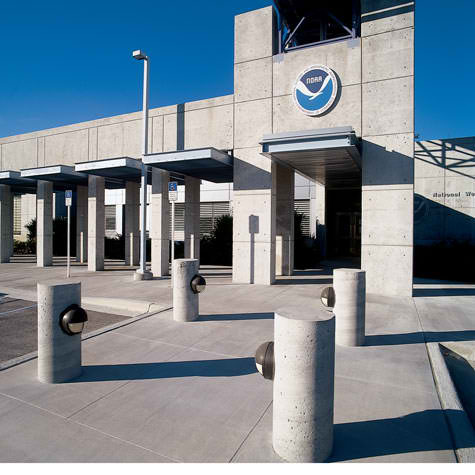 Now based on the campus of Florida International University in Miami, the National Hurricane Center makes it a priority to continually upgrade tracking and forecasting procedures, working with community leaders and local emergency agencies to improve their advisory outreach. One such improvement has been issuing tropical storm and hurricane alerts via cell phone applications, such as iAlert.com. By visiting the National Hurricane Center’s website you can obtain a wealth of information about hurricane prediction techniques, methodologies, FAQs, a history of the United States’ most devastating hurricanes, terms and abbreviations, and links to numerous other NOAA and weather-related sites. This entry was posted in Weather Articles and tagged hurricane season, hurricanes, national hurricane center, national weather service, tropical weather. Bookmark the permalink.